On Sunday, August 3, ESAF, the Egyptian Society of Animal Friends resumed their feeding program for the Pyramids animals, which they’ve been conducting for several years now. The animals fed and given vet care during the month of August numbered around 1,600 horses. They went five times a week in August. Since the program for this year started in February, they’ve fed and cared for 1,943 animals in February; 3,157 in March, 3,211 in April, in May and June, a total of 4,800 animals, in July 110 animals. The total so far in 2014 is 13,381 animals. These are horses, donkeys and camels, normally used to give rides to tourists visiting the Pyramids. Because of civil unrest in Egypt over the past few years, there’s been a sharp decline in tourism, and, due to lack of revenue, the animals owners haven’t been able to adequately care for them, so ESAF has stepped in to help. Ahmed El Sherbiny, Chairperson of ESAF, writes that the animals seem tired during August, having had to work longer hours during Ramadan. Despite this, they have generally observed an improvement in the animals’ condition over the course of the year. 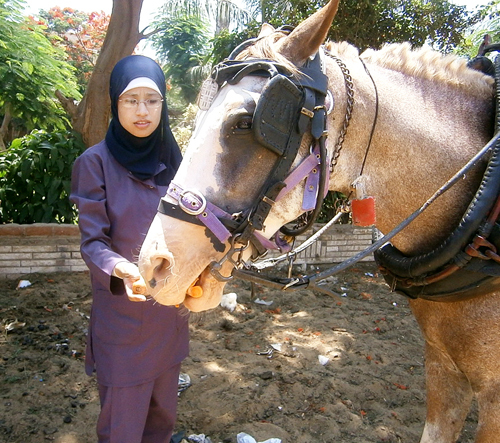 They also handed out nose bands, fly masks, and educational brochures, as well as treating the animals’ hooves and teeth. On May first, they added carrots to their diet, which provides more nutrition and is also a much-appreciated treat. Tourism is still down, but there are signs of a possible turn for the better. Soon, they’ll be altering the schedule to do twice weekly feeding for the Pyramids animals, and will be operating clinics two to three times a week to care for animals in the neighborhood near the ESAF shelter, where they have been much missed over the past couple of years during the time that ESAF has focused on the Pyramids area. ESAF expresses their heartfelt thanks to SPANA, Animal Aid Abroad, Sue Evans and her UK group, and Mr. Richard Gabriel for their generous support of this project.